A Brazilian chicken has no shortage of legs to samba dance with after being born with four of the extremities. Despite bleak predictions that the chick would die within hours of being born, it has defied all odds, strutting with pride for ten days so far. 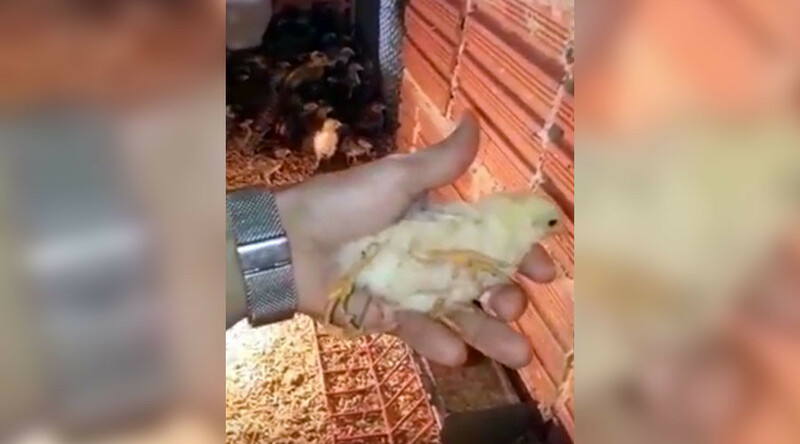 Born on March 14, the 10-day-old chick could be seen easily out-manoeuvring its brothers and sisters in a video shot at its home, a farm in Mancio Lima, in the Acre region of Brazil. The extra limbs appear to be inanimate in the video, remaining still as it walks around the coop. Dienes Lima, the owner of the farm, said he was worried the chick would die within hours of being born due to it’s deformity. Still alive and kicking, Lima has now made the unique chick the farm’s mascot. What caused the abnormality is unknown. If evolution is quickly catching chickens up with humans, mankind should be worried as, earlier in the week, a monstrous-sized Chicken-zilla caused gasps of disbelief when a video of it went viral.